Are our undergraduate engineering (BE) students being forced to publish papers? Since the fake paper I managed to publish this weekend, I’ve been hearing disturbing reports that even undergraduate students are being forced to publish papers by college authorities. It is my understanding that there are no University requirements that make it mandatory for undergraduate engineering students to publish papers either as a part of their BE Project, or anything else. 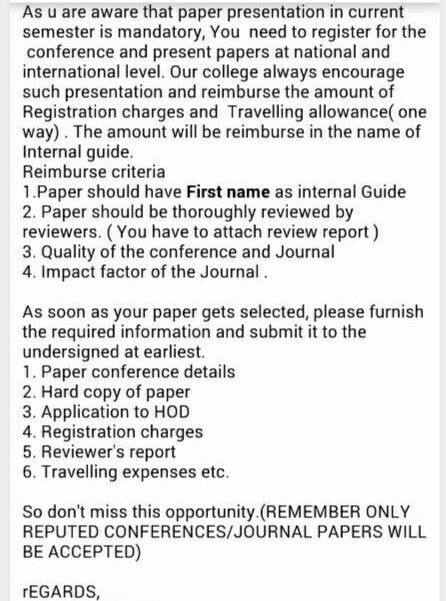 Students must submit and preferably publish atleast one technical paper in the conferences held by IITs, Central Universities or UoP Conference or International Conferences in Europe or US. I have first hand experience with this. A student group who did their BE Project with me a couple of years ago were desperate to get their BE Project published (in fact, as I pointed out in my previous article, this incident is what started off the thought process that culminated in my fake paper this weekend). I protested that this requirement makes no sense, and forced them to go to their college and get the issue clarified. They came back to me and reported that they were told by college authorities that it was a mandatory requirement. What if the students were unable to get your paper published? The students were told to attach rejection letters from the conference – but submission was compulsory, they were told. At that time, my worry was that all these BE students would submit substandard BE Project reports as research papers to conferences and spoil the reputation of Indian researchers. Little did I know that the papers would actually get accepted by the conference they submitted the paper to. Now comes something even more ridiculous. I was sent this image of a notice put up in a prominent local Engineering college, and was told that this requirement was made mandatory by the college for 3rd year BE students (October 2013). I was told that most of the students did publish papers. I have not yet verified whether this is indeed all true, but based on my past experiences, I am sure there are colleges where the students are indeed to forced to try to publish papers during their undergraduate studies. I was told that this notice was a requirement for 3rd year engineering students last semester (Fall 2013)!! The only good news here is that the students were being reimbursed for (part of(?)) their expenses. But other than that, there are so many things wrong with this picture. Also, do point out that student themselves are so indoctrinated, they actually, sincerely believe that publication is a requirement. This is why the market is ripe for [conferences like these]. I know firsthand that students believe that such publications are actually good for them and their resume. I guess I am an idiot for arguing with them that this is not true. Is this a common occurrence? Are other BE colleges making such arbitrary publication requirements? What can/should be done about this? Posted on December 31, 2013 December 31, 2013 Author navinCategories EducationTags conference, education, fake, paper, post-graduation, publications, research, students4 Comments on Are our undergraduate engineering (BE) students being forced to publish papers? Since the fake paper I managed to publish this weekend, and the resulting Mid-Day story, the reporter from Mid-Day has been busy following up with next steps. One day later, there are two new stories in Mid-Day. The first one is good news. The Vice Chancellor of the University of Pune has confirmed that publications are not mandatory for getting an ME/MTech degree, just recommended. Considering that students are being given an incorrect impression, a circular is being issued to the colleges in the University of Pune clarifying this. Another, less savory aspect of this affair is the impact on the people involved in the organization of that conference. The story related to that is here, and manages to uncover some more interesting details of what was going on behind the scenes at that conference. Earlier today, I wrote about the fake paper I published. to attend any of the upcoming IRAJ Conference. Yesterday, the paper had appeared in the online conference proceedings in the IRAJ website. The paper has now disappeared. We were expecting this, so we had archived the relevant webpage at the Wayback Machine. The online proceedings page is here. Compare this with the current version of the page. See the difference in paper number 20? Unfortunately, the PDF of the paper cannot be archived by the Wayback Machine. But here is a long list of people who downloaded the paper form the IRAJ website, on December 29 and morning of December 30 2013, and confirmed that the paper indeed contained nonsense. Also, I am pretty sad that I am disqualified from attending upcoming IRAJ conferences. The next one in Pune, happening just one week from now, is International Conference Academics on Computer Science and Information Technology. But, this time, I hope the organizers read the accepted papers more carefully.